I’m going with five out of five for ‘The Lunchbox’. The greatest love stories are the ones that make you root for the protagonists to come together, despite their destinies. This film illustrates how love transforms the unlikeliest of people; it breaks down Saajan’s walls and gives Ila the courage to fly. Treat yourself to ‘The Lunchbox’ – it’ll leave you with a craving to seek your own little happiness. The best film I’ve seen in a long time. A well-told old-fashioned romance, THE LUNCHBOX gracefully unknots the trials, tribulations, fears and hopes of everyday people sans the glamour that the city of Mumbai has become synonymous with. On the whole, THE LUNCHBOX is a standout film, a sumptuous treat that’s sure to be relished by connoisseurs of cinema. A film with a big heart, it makes you realize that you can unearth contentment and pleasure even if you board the wrong train. Easily one of the finest films to come out of India. 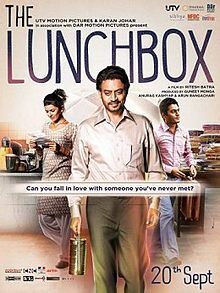 The Lunchbox is my favorite love story of the year. It’s sweet, sad and deeply aching. Debutant director Ritesh Batra captures the fragility of life, the harrowing loneliness that a metropolis like Mumbai fosters, the hope of happiness that glimmers and enables us to go on. The Lunchbox is poignant and powerful. It will make you laugh and cry. And it will also make you hungry – I was dying to eat paneer kofta and bhindi when it finished. I’m going with four stars and absolutely insisting that you see it. Could a simple lunchbox and its contents change lives? One of the best films to come out of India in a long time, director Ritesh Batra answers the question in his little masterpiece, The Lunchbox. I watched The Lunchbox twice over a few months and can testify that it has a high repeat quotient, the final confirmation that was required for a perfect rating. There’s buzz of an Oscar selection in the Best Foreign Language Film category. India will be hard-pressed to find a more deserving nominee. No doubt, the thin story-line, the slow pace and the laidback screenplay make the film class-appealing but it must be added that for that audience, the film offers a lot by way of entertainment. On the whole, The Lunchbox is a delightfully delicious film. It will be simply loved by the classes and will score in the multiplexes of the big cities. The start in several centres may be slow but collections will pick up in the big cities due to positive mouth publicity. It will win a lot of accolades and awards too. The Lunchbox has levels – it is the story of a man so lonely, he’s forgotten what any companionship means. It is the story of a suburban housewife, deeply alone. It is the story of meeting via eating. It is a love-story – and a love-letter to Mumbai, to trains that go dhak-dhak, to dabbawalas and rain, to love and life, sugar and spice, the despair and hope that mark every heart.Its finesse qualifies this charmer as India’s potential entry to the Oscars, The Lunchbox an unusual banquet, raising a bitter-sweet toast to life. Note: You may not like this movie if you don’t like softly spiced whimsical tales – or food. If it hadn’t been for the occasional flatness, and a couple of predictable notes, there would have been no flaws in this dabba. I also found Ila’s mother’s (Lillete Dubey) segment, included solely to underline another kind of vacantness, a little forced. But these are tiny niggles in this film that gets the rest of it so right. Batra’s characters are a delight. They may be of Mumbai, infused with intense desi flavours, but can inhabit any part of the world. You want to take them home, sit them down at your table, and savour them, one mouthful at a time. Batra, who has also written The Lunchbox, has allowed his smashing actors tremendous room to improvise, all the while himself sketching in nuanced details about the city, its food-ferriers, and the many disparities Mumbai is crammed with. It is a film of multiple pleasures — small ones and overwhelming ones and exquisitely crafted ones — layered one on top of the other, with something for everyone, and so, so much for the cinematic glutton. Like the dabbawalas he loves, this director delivers. It is a unique piece of cinema crafted with great dexterity and attention to detail. A strikingly original, idiosyncratic and charming love story, The Lunchbox dismantles the established structures of the genre in ways that are at once startling and effective.It isn’t just the life of the male protagonist that it touches.Gorge into it and savour its lingering aftertaste. The Lunchbox holds riches that aren’t likely to be forgotten in a hurry. Indian cinema ought to be proud of moments like these. But beyond the adulation of the world press, the best thing about this bittersweet movie is its desi flavour that gives it a universal appeal. This one may not please those looking for a masala flick, but is more than your money’s worth. But ensure that you eat well before you head for the movie, or else be prepared to deal with the hunger pangs everytime Irrfan opens The Lunchbox. Watch or Not? : The Lunchbox within the first few minutes made its way into the cockles of my heart. Elegantly done, the film conjures a connoisseur variety of cinema where love and romance are stretched beyond the contours marked out by epic Bollywood romances. The love here has so much tenderness, eulogizes companionship of two very unlikely people who are drawn close over notes exchanged via a lunchbox, which almost builds up as a character in their story. Films like these are gratifyingly piquant and should definitely not be missed! What stays in the mind at the end of ‘The Lunchbox’ is pretty much what stays in mind at the end of a memorable set by jazzmen – not their lapses but the heights they scale. Bottomline: Bon appetit! Miss this sumptuous movie, at your own peril.